Walterwerke had been working towards a more fuel-efficient motor with both increased power and endurance, having the advantage of an auxilliary cruising combustion chamber. Principles tested on the HWK 109-509.B, increased thrust injectors and a better system for improving propellant flow from the 109-509.A-2, were refined into the Walter HWK 109-509.C. Walters appear to have been promoting the 109-509.C from early in the development program, as it appears as a propulsion unit of choice in several of the rocket-powered projects which were submitted for the defence of the Reich in the close of 1944 ("Julia" and "Walli" to name but two). Walterwerke had spent some time developing the improvements to their designs into the "C" model. The plan was to increase the power output and endurance of the motor; but with the additional cruising chamber and associated control systems, there was a need to redefine the weight. Therefore for the 109-509.C, the box frame is now dispensed with, and a new thrust-bearing frame designed, with a new thrust plate. The picture above is taken from one of Professor A.D. Baxter's post war reports on Walterwerke. From the picture it is difficult to get a sense of scale, but the 109-509.C design is compact and neat, despite its complexity. The 109-509.C carries through the successful elements of the "A-2" model with T-Stoff starter tank and air ejectors to remove any air from the T-Stoff and C-Stoff propellant lines. The fuel flow control valve was repositioned by rolling it onto its back, and bringing the T-Stoff feed up and over the top of the motor. 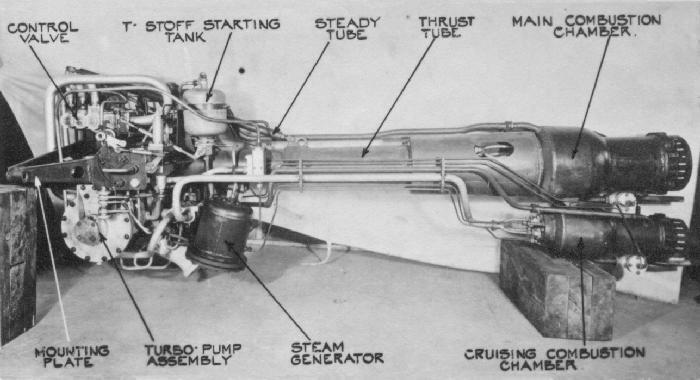 The fuel system for the cruising chamber is linked to the system for supplying the combustion products to the main chamber. One feature of note, is that the cruising chamber has a C-Stoff cooling flow inlet pipe delivering cooling C-Stoff to the hollow walls of the cruising combustion chamber. However, there is no corresponding outflow (return) pipe. The cooling C-Stoff is routed directly into the combustion chamber itself, for reaction. An illustration from a German paper shows a schematic view of the fuel flows. It is taken from a post war intelligence summary (CIOS Report) into which it has been copied, so the quality is low, which causes some of the fine detail to be confused. However, on study, it seems to confirm that there is an inflow line, but no outflow. Follow this link to study the schematic. To see pictures of the HWK 109-509.C motor preserved at the Aerospace Museum in Cosford, follow this link.